Axle Travel wants your trip to the airport to be fast and cheap. Here's how they plan to do it. 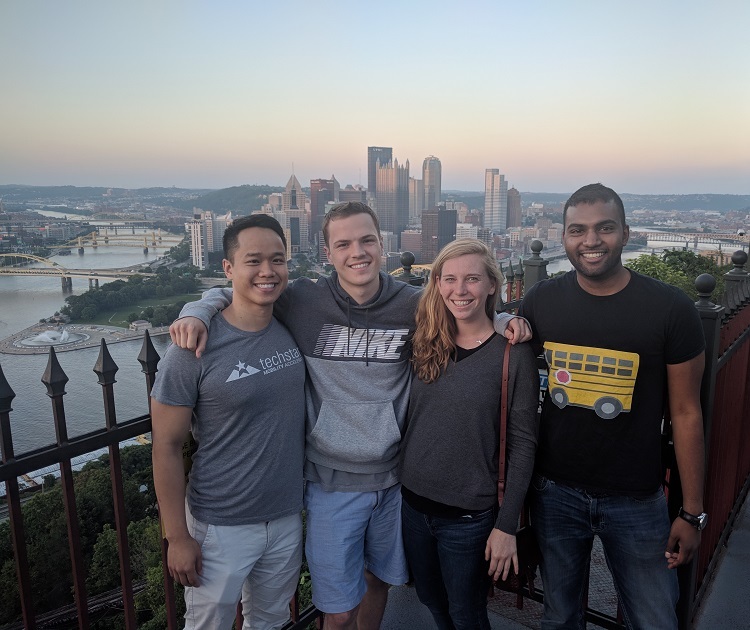 The Axle Travel team (left to right): Shawn Vo, Teddy Wahle, Dana Castner and Bharath Krishnamoorthy. Image courtesy of Axle Travel. Axle Travel wants your trip to the airport to be fast and cheap. Here’s how they plan to do it. Your flight is booked. Your bags are packed. You’re ready for vacation. 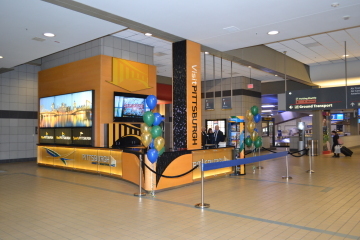 If you’re bound for Pittsburgh International Airport you have a range of options, none of them perfect: You can drive and pay for parking, which can be expensive. You can go via the SuperShuttle, which can mean a circuitous route picking up other people. Or you can Uber or Lyft, which can cost upwards of $40 each way. There’s always the inexpensive 28x Airport Flyer bus, of course, but you’ve got to get yourself and your luggage to a bus stop. Bharath Krishnamoorthy thinks he has a better solution. The Columbia Law School graduate is the CEO of Axle Travel, a technology start-up that combines existing ridesharing services with privately operated shuttles. The result is an airport commute designed to be faster than public transit, but cheaper than a private car. Here’s how it works: Visit Axle’s website several days before your trip and plug in the departure date and time you want to reach the airport. Their database will search for other travelers headed in the same direction to the airport at the same time. Assuming they find one or several matches, they’ll offer you a total ticket price (beginning at $15). If you accept, they’ll pick you up at your door, do the same for the other travelers and then you’ll all converge at a van pickup location. You’ll all hop in a shared van for the final leg of the journey down 376. For a hypothetical trip from Lawrenceville to the airport, Uber would cost about $40 and take about 35 minutes. The bus would cost just $5.50, but would take nearly 90 minutes. If Axle matches a rider with one other person traveling in the same direction, Krishnamoorthy estimates that the trip would take the same amount of time or just a few minutes longer than Uber. But would cost half as much — about $20. So that’s the key: If lots of travelers start using Axle, it will become easier to get matched with people. But in the meantime, if Axle can’t find you a match they’ll still offer you discounts on other transportation to the airport. His plan, though, is still subject to the whims of traffic. What if the other rider is late getting to the shared van pickup point? Krishnamoorthy says the shared van won’t wait more than five minutes. 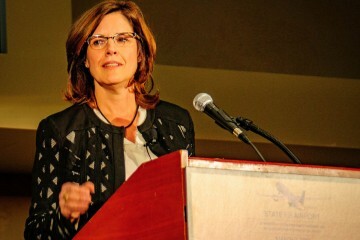 The service is expected to be available in Pittsburgh starting July 23. Krishnamoorthy and his lifelong friend and business partner Shawn Vo, who serves as CTO of the company, selected Pittsburgh as their launch site after testing the technology in other areas such New York City, Detroit, Denver and Napa Valley. “We were looking for a city where it was really difficult for people to get to the airport without driving their own vehicle,” Krishnamoorthy says, adding that they felt Pittsburgh’s younger demographic would be apt to explore new, tech-based travel alternatives.